Cherry cheesecake would be a nice end of any meal. Why don't you take a piece and enjoy it on National Cherry Cheesecake Day, that falls on April 23? Savory cheesecakes were popular in ancient Greece. Soft fresh cheeses like ricotta existed in Europe for centuries, that made possible making a variety of any kind cheesecakes, savory and sweet. However, cream cheese was invented by accident in New York only in 1872, that later gave the Philadelphia brand name. This company promoted cheesecakes with cream cheese only in the beginning of the 20th century, that is how the iconic American dish was born. 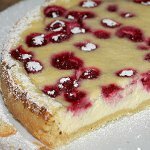 You can find hundreds of recipes for cherry cheesecake. The crust is usually made of graham cracker crumbs and the filling is cream cheese. You can mix cherries within the batter of the filling or put them on top. If you don't have fresh cherries to make cheesecake, you can use frozen or canned cherries. By the way, you could try also Black Forest cherry cheesecake, that is a combination of two worlds. There's nothing better than cherry flavored chocolate cheesecake with a fresh cherry topping!